Just to let you know I have a Mcgizmo UV with the 365nm Nichia, Titanium body. I have tried to find amber too and found it very difficult. So many other things light up on the sand like shells, seaweed etc that you cannot distinguish the amber from them. Daylight is better I am afraid. A piece of amber I tested indoors does flouresce, it's just that in a beach environment you cannot distinguish it from everything else. Does anyone worry about special glasses for these? 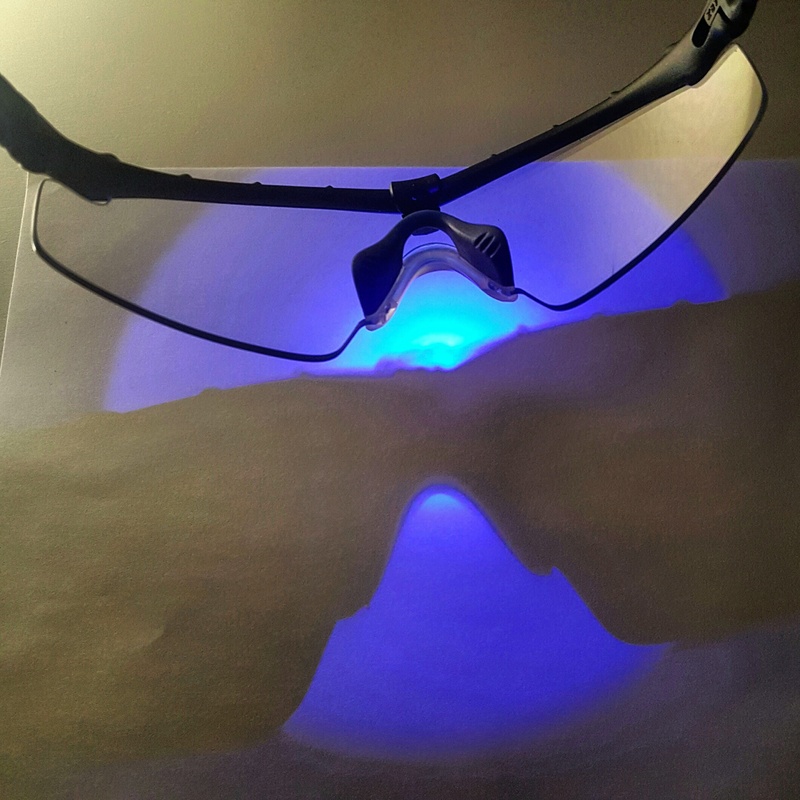 I have always wanted a UV light that makes things fluoresce but have seen warnings, is it overkill to have to wear some glasses as i would rather not. Cool. Glad it got to you OK. I just got a UV Haiku from Don. This thing is awesome. I am amazed by the ability of it to make things fluoresce. It's very powerful. The low setting seems to be enough most of the time. Last edited by Spyder333; 02-26-2017 at 02:59 PM. Cool! Got any scorpions around you can shine it on??? I went searching around my house, but I didn't see any scorpions. Not that I'm complaining about that. I know a few places out in the country where I can find them. Hopefully I'll get some cool pics soon. I have a real cheap hotel checker UV, but, I see plenty on them with that. I have been meaning to up grade to a Mc Gizmo Haiku soon. What would you get for looking around the desert at night? Thanks for any advice from the people who know better than I do! Last edited by RedLED; 03-01-2017 at 02:00 AM. I would think that the sundrop would give you the best combination of flood and even intensity of the UV light to make searching easier. I'm kind of wishing I had gone that route with my UV light. I wonder if I could just buy the sundrop head and put the haiku's light engine in it? Would it fit? I think it would, better ask there more informed here, it could be above my pay grade...which isn't bad, but still. Yes as long as it is the XR-U SunDrop (most likely it is) it will have plenty of space for the emitter on your UV light engine. Yes, the Light engine can be swapped back and forth between the Haiku with modified reflector and the SunDrop head. I have recently received a new UV 365 nm LED form Nichia that I will be offering for those seeking a 365 nm UV light. The Nichia NVSU233A LED is comparable in output at the current level of 600 mA driven by the 3S converter to the 033B that I have been using but it has a maximum current rating of 1400 mA compared to the 700 mA of the 033B. This means that the LED can be used with the HIVE converter in stock output and provide near double the radiant flux output. The price from Nichia has dropped with these new LED's and I can use a reflector in the Haiku without requiring modification. The package of the LED is much smaller than the 033B and uses the same solder pad foot print as the 119V Nichia. At 1000 mA drive current, the LED's I have will put out a minimum of 1040 mW radiant power to a maximum of 1130 mW radiant power. That is a lot of light!! This LED is not a toy! I have edited the first post in this thread with some of this information. To make it easier for me and you to figure out a price on any of my lights using this new UV LED, just add $30 to the price of the light were it to be built with an XPG2 or 119V LED. I built a Haiku HIVE UV light with this LED and on the HIVE's low low. 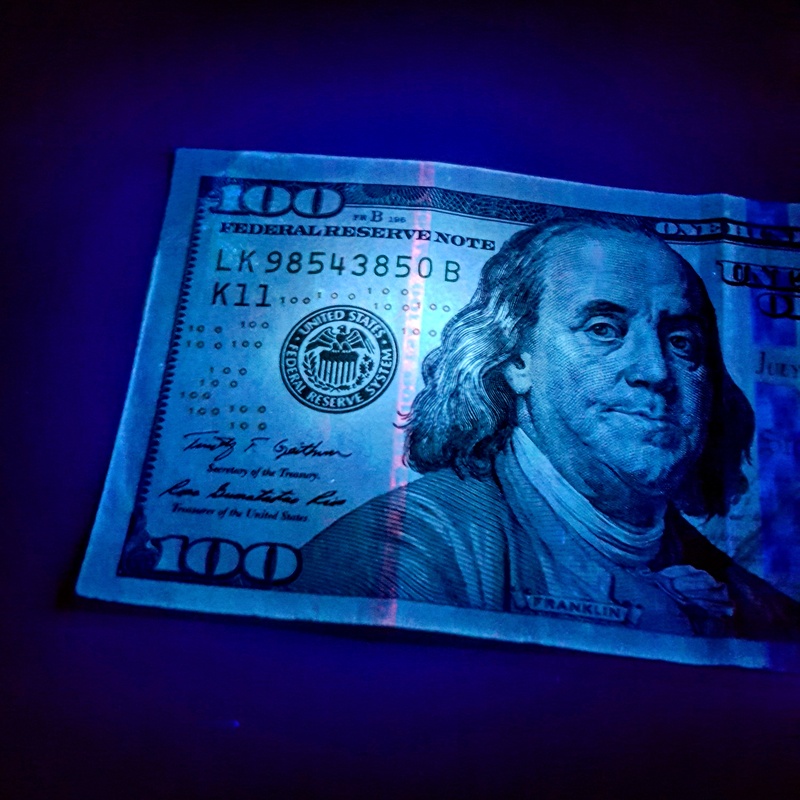 there is plenty UV light to excite the strips in US currency in ambient light. On high, the light reaches out a long way and fluoresces objects amazingly well. As a side note, I still have a few of the original SunDrop heads which have a shorter gap between LED and lens and these are ideal with this UV LED in terms of maximizing the light output through the front end. If anyone wants one of them, please so specify as original SunDrop head. This LED will work in the Mule, SunDrop (both versions), Haiku and Makai heads as well as in Aqua/Terra Mule and Ram lights. isn't 1130 mW of uv light too dangerous? I mean you can end up with skin cancer or smth.. I guess 365 nm wavelength is too long to penetrate skin. The worst you may do -- is to damage your eyes. I agree with vadimax that the concern relates primarily to potential damage to the eyes and I do believe one needs to be very careful when using a UV light that they do not allow the UV light to enter their eyes. Like many tools, there is inherent risk if the tool is not used properly or safely; not a toy. 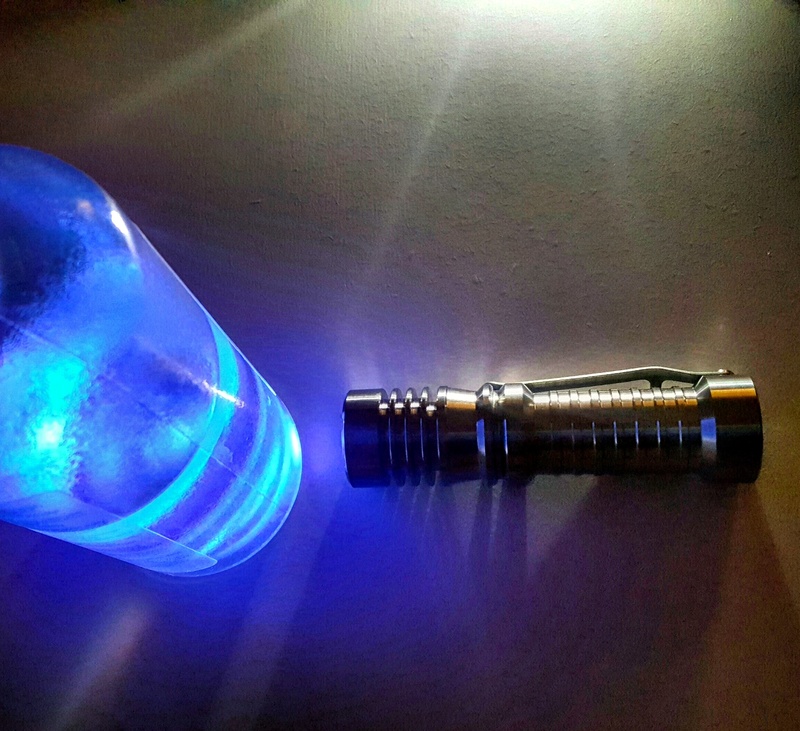 That being said, I think the Sundrop is the best host for a high-power UV light. It's focused enough that you don't have to blast it on the highest setting to get decent fluorescence from across the room, but it doesn't focus most of the light in one spot so you don't miss stuff in the periphery. Remember, UV lights are used for finding things you can't already see, so you don't necessarily know where to aim the light. Last edited by dino2024; 06-03-2017 at 06:35 AM. So this would not be the best hotel checker. I stay at 4 and 5 star hotels (Sorry, but I just can't go back, believe me I paid my dues traveling when I was younger), however, that does not mean the CEO or the MC from the night before was...well, you get it. I just really want a McGizmo UV! It's hard to go back from them also. Also, what to most use the Sapphire model for, I would like one of those, too. Last edited by RedLED; 08-17-2017 at 01:19 AM.